These cabinet doors have a plywood panel with a raised effect arched-top plywood panel glued on to the face. - Manufactured from Red Meranti Hardwood by Johnson-Aldridge Doors. - Fine-sanded finish, ready for painting or staining. - Fascias for use as cupboard/­kitchen/­display cabinet doors. Cabinet Door heights include; 18", 24", 30", 66" & 72". 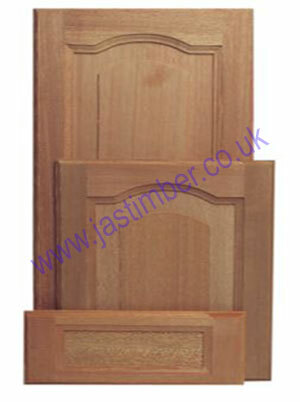 - 18" Cabinet Doors from only £5.60 (+vat). - 24" Cabinet Doors from only £6.70 (+vat). - 30" Cabinet Doors from only £8.70 (+vat). - 66" Cabinet Doors from only £16.95 (+vat). - 72" Cabinet Doors from only £17.50 (+vat).